Jazz notes • Center hopes diet, exercise block late-season fade. 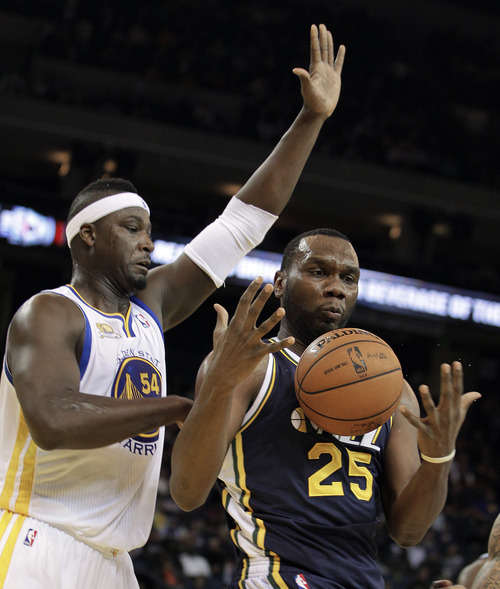 Oakland, Calif. • Being in NBA shape by the eighth game of a season hasn't been a serious problem for Jazz center Al Jefferson during his eight-year career. Playing at 100 percent of his potential toward the end of a grueling campaign sometimes has been, though. Jefferson has acknowledged several times since training camp started that he wore down toward the end of 2010-11, his first season with Utah. Coming into a lockout-shortened 2011-12 campaign that features hectic travel and a compressed calendar, Big Al is making more of an effort than ever before to stay healthy and in shape for the long haul. "It's always been a problem staying [in shape] for me. This year, I'm going to try something different and do the right thing," said Jefferson, prior to Utah's game Saturday night against the Golden State Warriors. Jefferson plans to hit the weight room throughout the season. And the Mississippi-born big man has even taken the drastic step of cutting fried food and sweets out of his diet. "That's hard. Especially since I'm from the South," said Jefferson, who might soon hire a personal chef. "I'm just eating food that's going to give me energy and help me on these back-to-back-to-backs." A sharpened focus has initially paid dividends for Jefferson. He entered the Warriors game leading the Jazz in average points (18.7) and minutes (32.5), while ranking second in rebounds (8.5). His defense has also improved. Jefferson led Utah in blocks (1.6), and he's shown better lateral movement and an increased leaping ability after working out last summer in Santa Barbara, Calif.
Jazz coach Tyrone Corbin said anything Jefferson can do to be as valuable to the team in late April as he's been thus far will be greatly appreciated. "It's hugely important for us," Corbin said. "One of the things we talked about right from day one is making sure we do things as a group of guys individually to make sure we stay as strong as we can as long as we can." Just because forward Gordon Hayward's shot was off through Utah's first seven games didn't mean Corbin wanted the 21-year-old to stop firing away. Hayward entered the Golden State contest shooting 40.8 percent from the field and just 22.2 percent behind the 3-point line. He was taking shots in rhythm and playing within the Jazz's offense, though, and Corbin's willing to trade early misses for long-term confidence. "He's taking the right shots, which is the most important thing," Corbin said. Hayward responded by scoring 11 first-half points on 4-of-6 shooting against the Warriors, while hitting both of his 3-point attempts. Jazz forward Jeremy Evans (stomach flu) did not dress against Golden State.